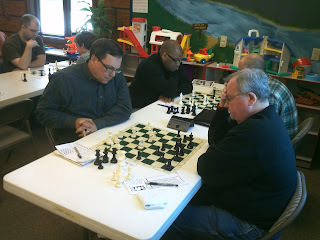 ORCA's 2013 Winter Seasonal Tournament was held on February 2. 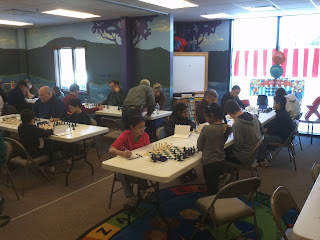 A total of 34 players competed in two sections. Players attended from as far away as Madison, Sun Prairie and Sheboygan, in addition to the contingent from the Milwaukee and Mequon area. First and second in each section received cash prizes. U1700 and U1200 were each awarded a book prize. Special thanks to the two players who donated their winnings back to ORCA. 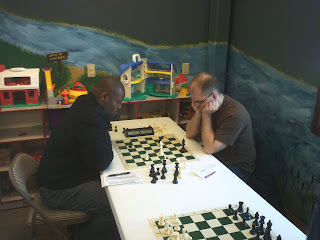 Stephan Desmoulin and Jon McKinney prove the old adage "All Rook endings are drawn". the warning sign painted on the wall, "Enter at Own Risk". Round 1 action in the Reserve Section. A view of the Reserve Section and part of the Open Section (Round 2). Steve Etzel (l) unleashes his own version of the "Tal Stare" versus Al Buschmann (r) in Round 3. 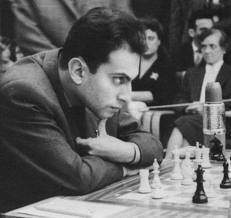 The original "Tal Stare" courtesy of former World Champion Mikhail Tal. That's the reason I was getting headaches during our game. Perhaps sunglasses are in order.